"One of my goals is to actually have them leave with a real sense of their ability to move between disciplines and be able to make these connections." The syllabus for Natalie Phillips’ honors interdisciplinary course “Cognitive Science and the Literary History of Mind” (ENG 492H) includes an 18th Century novel, modern neuroscience articles from PubMed, and an anatomical engraving of the brain from the 1680s. It’s a mix of coursework inspired by a conference Phillips attended as a postdoc. Phillips is the 2014 recipient of the Honors College’s Distinguished Contributions to Honors Students Award. She’s an assistant professor of English, specializing in 18th-century literature, the history of mind, and cognitive approaches to narrative. “One of my goals is to actually have them leave with a real sense of their ability to move between these sort of disciplines and be able to make these connections,” she said. 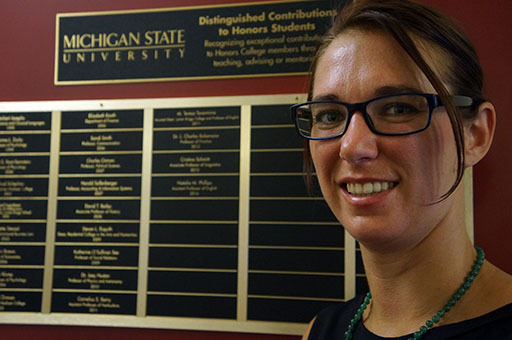 After joining the Michigan State University faculty three years ago, Phillips quickly learned students in her honors English course were interested in her research pursuits. In conjunction with faculty at Stanford University, Phillips had research participants reading Jane Austen in an fMRI machine, tracking their close reading and pleasure reading techniques. The research also used compatible eye tracking to see what parts of Austen’s “Mansfield Park” the reader focused on intently, or skimmed. “We’re actually looking at how these different levels of attention, or study, influence brain activity,” she said. The data analysis is all being done at MSU through the Digital Humanities and Literary Cognition Lab. Several of Phillips’ current and former Honors College students have contributed to the research, including Craig Pearson, Shan Kothari, and Paige Fouty. Phillips also participates as a research mentor in the Honors College’s Professorial Assistantship (PA) program, with Honors College members Katie Grimes and Savannah Smith, who helped research, organize, and edit Phillips’ first book, Distraction: Problems of Attention in Eighteenth-Century Literature. “As undergraduates, they can really dig in and do something that’s going to be lasting,” she said. She was delighted when they worked together to nominate her for the Honors College award. The award was established by the Honors College Dean’s Advisory Council and the Honors College Alumni Association in 1999 to recognize faculty members who strive to make remarkable contributions through teaching, advising, and mentoring Honors College members. Phillips received a certificate, recognition at the Honors College Convocation in August, and an honorarium of $1,000.